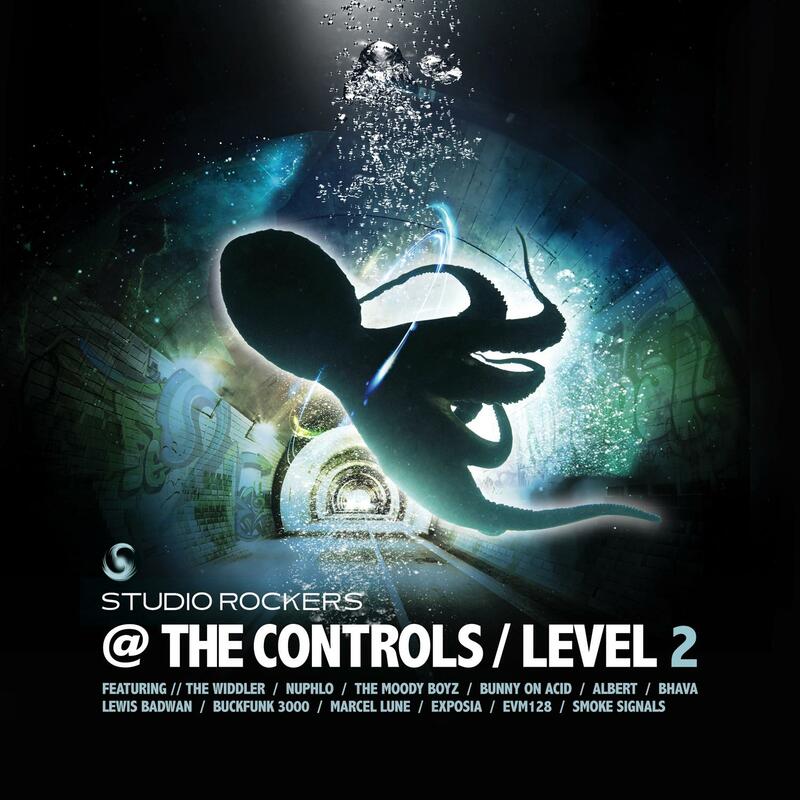 "Studio Rockers @ The Controls Level 2"
Big sounds, ethereal synthesized landscapes and fat bass, the sound of the Studio Rockersâ€™ New Year and itâ€™s going to be a big one. A mash-up of some Studio Rockers heavyweights and some young bloods feature on this 15-Track compilation. Coming at you with a range of sounds from some of the finest production talent you've ever heard on the same compilation. Some strong tracks from Moody Boyz, Bunny on Acid, EVM128 and Marcel Lune also with some new names youâ€™ll definitely be hearing more of. Starting off your journey with a guided introduction to the Studio Rockers' vibe for the new year from The Moody Boyz, a hot track with bass drops that just don't stop, already receiving big love from Tom Middleton and Joe Muggs with 'EAN' featuring on a Solid Steel mix. Followed up by some more innovative world sounds from Nuphlo dropping an exclusive re-work of his single 'Nona', the Midlands based producer really showcases his ability refresh his approach and create new sounds. 'The Final Stage' is guaranteed to sound raw on any dancefloor, with an insane cacophony of bleeping and more bass than you'll know what to do with The Widdler continues to drop hard rhythms. Bursting out of Karachi's budding electronic scene with clever rhythm juggling and serene vocal samples is Rudoh with his first UK release, 'Come To My Mind' recently gaining attention from VICE magazine over his Pakistan based label, Forever South. 'Locked' shows you with its unstoppable pulse and rich bass that Bunny on Acid is back and ready for a big year with Studio Rockers. Dusk FM's resident DJ's Lyeform & Nomi release their first track with Studio Rockers, 'Get Lost', and it slips in with an ethereal soundscape cut short by a deep vocal before it goes into a tasty subby groove that keeps chugging along. Then Marcel Lune stutters in sweeping and swimming sounds in 'Mungenden' until it concludes with some tantalizing vocal sample play. Jumping straight out of the compilation at number 8 is a jumpy electronic number from Buckfunk 3000 pulsating drums and some synth wizardry, exactly what you need. Next up a real banger from EVM128, a garage remix of his 'Naked Truth' single that gained a lot of radio support from Annie Mac and Monki on Radio 1 last year, now back with a remix. We know youâ€™re going to feel it. Straight in with some dark bass structures from Ollie Realness, another new name and sound to add to the Studio Rockers year, this warped, deep track gives a great contrast to some of the more ambient tracks on the compilation, truly showing the spectrum of current bass music. Lewis Badwan is back after a big year with Studio Rockers slipping into his brooding, melodic 'Sea of Trees', the track hypnotizes and swirls with swelling chords until it eventually crests and breaks with clever use of layered percussion. Another return to Studio Rockers from Albert with 'Dripping The Who' coming hard with deep bass and a pounding four to the floor, a pumping track that'll keep you moving with some toasting-esque use of sampling. Calming the vibe again some more new blood, Exposia creates interesting ambient textures with 'Hold Me Back' and then drops a tranquil female vocal that shows the contrast to the relaxed side of Studio Rockers New Year. A glittery, shimmering track from another new name, Bhava is featuring the aptly named 'Shimmer' as the penultimate track for the compilation, tasty 808 sounds and such a gentle harmonic guitar part. Rounding the compilation off with Smoke Signals' 'Let Go' with a massive bass and huge beat, innovatively orchestrated with beautiful reversed guitar sounds and an infectiously sweet vocal melody. New names, some Studio Rockers stalwarts and 15 fresh tracks, including 12 exclusive tracks, are going to take you on a journey through the most exciting new bass music youâ€™re going to hear all year. Recorded in London and Manchester.